This year is my year to finally get healthy again…. or at least health-ier. 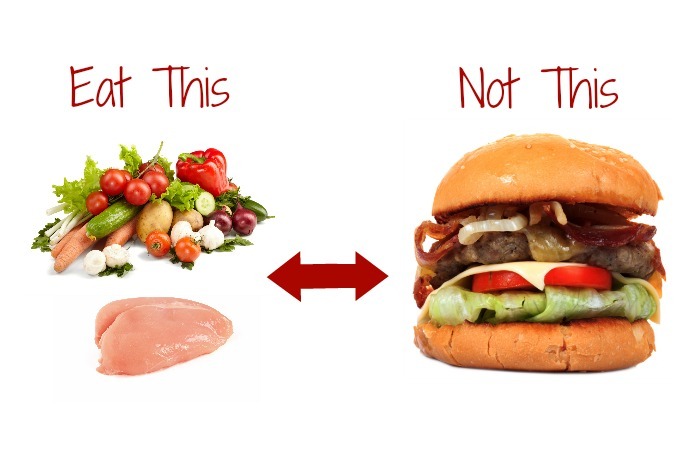 What you put in your body – what you eat – is a super important part of being healthy. I have been keenly aware over the last few months that what I put in Chester and Gretel’s body is way better than what I put in my own. People often ask me what I feed Chester and Gretel. I have largely dodged that question. Well, no more. I dodged the question for a lot of reasons. The primary reason was that I didn’t think this blog was about what Chester and Gretel eat or a particular feeding method. There is a lot of controversy online about what your dog should or shouldn’t eat and I didn’t want to jump into that debate. However, what we eat IS important. It’s important because what I feed Chester and Gretel keeps them healthy enough to do vigorous activities with me like hike and run. Chester was blessed with good genes but I know the food I give him has helped keep him spry in his senior years. While there is nothing wrong with a cheeseburger, soda, or ice cream cone now and then, I partake in these things on a pretty regular basis. Have you ever heard the phrase “I’m sick and tired of feeling sick and tired”? Well, that’s where I’m at. What I eat definitely affects how I feel. I know I am sensitive to gluten yet my “once a week cheat” has turned back into a daily habit. It makes me feel tired, foggy headed and often gives me a headache. I am way less motivated to do things when I feel that way. When Chester was a young pup, I think I fed him what was the equivalent of a cheeseburger. Now Chester and Gretel eat closer to what you see on the left there. Like me, he also probably ate more than he needed to. I was sorting through my photo files the other day and ran across a fat dog. Because of the Dachshund Club I run – The Adventurewiener Club – I have a lot of photos of dogs. I had to look really close at this one though. It turns out this fat Dachshund was Chester! That is Chester on the left a year or so ago at 12 years old vs. him when he was about 6 years ago. I kid you not! He was active back then too. The only difference between now and then is what he heats and how much he eats. Sadly, I look more like the Chester on the right these days. I want to look like the Chester on the left – fit and full of energy! Over the next couple of weeks I am going to share how I went from feeding Chester cheeseburgers to what he eats now. <– I laugh at that because it sounds like one of those weight loss or health infomercials but it’s not. While I am talking about the gradual transition in Chester and Gretel’s diet, I am also going to be looking at little changes I can make in mine. I think health and eating well is a journey and it’s ok to take one small step at a time. I’ll give you chocolate as long as it’s dark. Ha, ha. I’ve touched on feeding before on my blog and I ended up with a woman trolling me for months telling me I was an animal abuser because I fed my dogs kibble. That kind of crazy is not going to change anyone’s minds 🙂 I’m a little more prepared for the possible backlash because of her though. I’m excited to read this series! 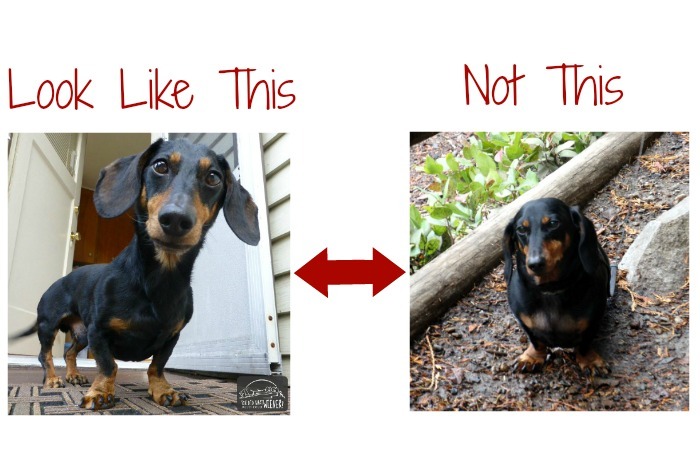 I’m with you – the online debate about what to feed dogs has gotten ridiculous. I stay out of it the best I can. All I know is my dogs are healthy, and that’s what matters. However, Khloee needs to shed a pound and so does Wynston. My problem is giving them human food. What I started doing is instead of giving them a piece of my dinner, I cut up veggies to give them instead. Luckily all of my dogs love veggies. Instead of letting them have a piece of potato chip or something super bad for them, I hand them a carrot or piece of apple. It’s hard, especially with Wynston’s manipulation. I lost weight over the past year so I’m trying to keep it off, but boy is it hard! Human food is a big issue and a challenge for everyone I think. Even I want to cave when I have cheese and they give me that look. I’ve compromised, like you, by allowing myself to freely give them fruits and veggies. My hubby is a little more lenient though, and liberal with treats in general, so I have to get on him about it sometimes. Congrats on your weight loss. I know you were sick a lot so I hope too much of it wasn’t because of that but I’ve been there. Honestly, any weight loss was a silver lining for me. I often wish someone controlled my eating like I control my dogs, I would be so much healthier. I have been making slow changes to my own diet this year. I have been gluten free for nearly 4 years with “challenges” and no cheats. I eat low dairy because I am sensitive (less so than my sensitivity to gluten) and low soy because of hormone issues. I have added the green smoothie to my mornings. I have increased my fibre. I am now working to make sure I eat at least 5 servings of veggies and to reduce my sugar intake. The sugar is actually the hardest. I wish you the best on your healthy food journey and look forward to following it. I know, right? Things would be so much easier for me if someone dictated what and how much I ate. If I ever get rich, I am hiring a personal nutritionist/chef for sure. I love smoothies but you have to be really careful because they can be a lot of sugar in disguise….even green smoothies. Do you have a favorite recipe? I put in generally 1/2 banana, a handful or two or spinach, 1/4 cup of berries (which everyone is on sale), I am experimenting with adding a little lemon juice or like a tablespoon of OJ to go with the water I use to mix it. I am trying to find the smallest amount to not make it taste too watery. Since I can’t use any sort of yogurt, that is hard. I also will add hemp seeds and/or flax. Sometimes I add cucumber or Kale or other greens. I am my dogs personal trainer and food nutritionist..I wish I had someone to get me to be more disciplined! I finally did get in control of my diet recently and i’ve lost 25 pounds!! It really helps! That and getting into zumba which I just love! Good for you! That’s a big accomplishment. I have about 40 lbs to lose. I don’t drink so that’s not my issue. I definitely eat more than I should though so my focus is on eating my “regular food”, with a few modifications, but just eating less of it. It’s hard to believe it’s Chester in both photos. He looks great for a dog of any age, but especially a 12 year old dog! Once I looked at the photos, this post REALLY felt like one of those diet product ads. Ha, ha. I sear it’s not just lighting and angle here though 🙂 I am positive that staying thin has helped him to age well. Looking forward to seeing series develop. Harley and Charlie have lost a few pounds extra since transitioning to Dr. Harvey’s. They were the pesky last couple of pounds that I knew would make a difference for Harley who is an arthritic senior. I was right, while they had always been considered, ideal weight, the few extra lb has made all the difference. Best of luck, just remember to do a little better each day! It’s easier for me to do “a little better each day” with Chester and Gretel than for myself 🙂 I am glad that better food, and loosing a little weight, helped Harley.